From the earliest days of Mystery House’s black and white stick figures and line drawings to full-colour 3D presentations, Sierra always tried to stay at the forefront of graphics technology, innovating as they went. In their early 16 colour games, the artwork would be drawn either by hand, then plotted into the computer using coordinates as if drawn on a piece of grid paper, or it would be drawn directly into the computer using a tablet device. These vector-based graphics were all coded within the game, a line would be drawn between two sets of coordinates, and a colour would fill the spaces between lines. It wasn’t an easy process but it worked well and saved a lot of disk space, which was always at a premium. For Sierra, one of the biggest challenges in graphics came in the early 1990s when 256 colour VGA graphics cards reached the PC market. “Once VGA came in, we actually took a little different turn than most of the studios working at the time and realised that because you only had 256 colours, if you worked in a digital paint program like Deluxe Paint, everything looked very pixelated. It was very difficult to make anything look smooth or to imply colours,” says Bill Davis, Sierra’s first Creative Director. Hiring Bill was a major coup for Sierra, bringing his highly-acclaimed talents and extensive experience as an artist, graphic designer and painter into the fold. It was at this point that Bill decided they could draw backgrounds and animations with traditional media and then scan that work into the game, giving a much more realistic and less pixelated look than their competitors. A clear indication that the changes made to the design process for 256 colour games was successful was the recognition Sierra received from their competitors, as Bill Davis recalls. “I’m a big believer, especially when you’re doing art styles, in suiting the style to the genre,” Bill says. “There was a lot of thinking in the beginning, especially with the newer games and resurfacing the older games, [about] kind of picking what style is really going to be the optimum style and have the most wow factor for these games when they come out. I don’t think they were doing that in the industry, they were just doing art. “So I would do things, like, with Leisure Suit Larry, why don’t we do cubism? 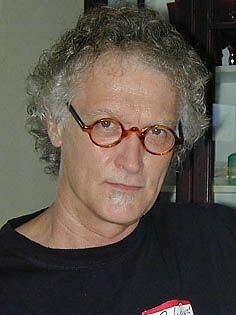 We could do it, it would be great and it would suit the kind of wacky world that Larry lived in. When we started doing the edutainment titles, games like Twisty History [working title for Pepper’s Adventures in Time], we had a game that was going back in time to be with Ben Franklin. I thought about Grant Wood, a great American artist who painted a lot of revolutionary scenes in America, so we styled it that way. So it was that kind of stuff. Instead of ever-changing art styles within series, Bill Davis encouraged a more consistent internal approach. 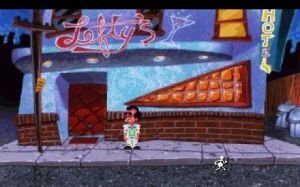 Leisure Suit Larry was given a fuller, more cartoony style to better suit its comic sensibilities when the 256 colour remake was released. Another change Bill made was to introduce the role of Art Director to the process, giving one person oversight of the art for a game, something that was now required as the number of artists had grown enormously since their earlier games. Interesting read! Lifelong fan of Sierra. Fascinating insights on the art process.